Providing the clearest indication yet that he is rapidly "putting together a war cabinet," President Donald Trump announced in a tweet Thursday night that John Bolton—described by one commentator as the "most reckless and consistently wrongheaded extremist in American public life"—will replace H.R. McMaster as his national security adviser early next month. Formerly the U.S. Ambassador to the United Nations during the Bush administration, Bolton was one of the most enthusiastic supporters of the invasion of Iraq and has over the past decade repeatedly called for war with Iran and North Korea as a regular guest on FOX News and in the op-ed pages of some of America's most prominent right-wing editorial pages. Though he reportedly promised Trump "he wouldn't start any wars" if he got the position, foreign policy analysts and lawmakers argued that Bolton's long record of warmongering indicates that he will attempt to do precisely that. 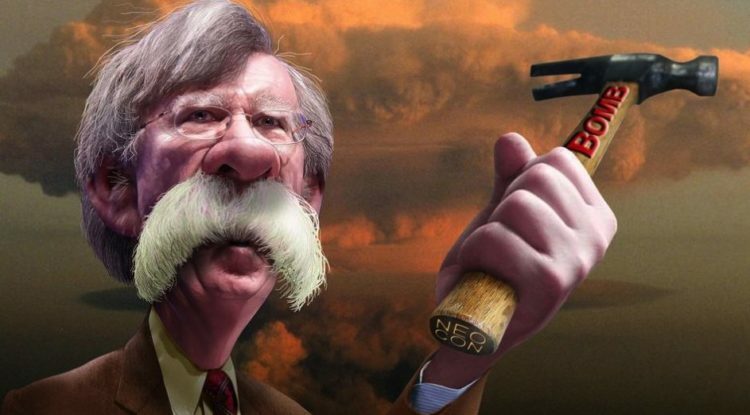 "Bolton is an unhinged advocate for waging World War III," Trita Parsi, president of the National Iranian American Council (NIAC), said in a statement in response to the news Thursday night. "Congress must do everything in its power to convince Trump to reconsider this decision and exert maximal pressure to constrain Bolton's ability to impose irreparable harm to the U.S. and global security. Bolton now represents the greatest threat to the United States." Combined with his appointment earlier this month of current CIA Director Mike Pompeo to replace Rex Tillerson as secretary of state, the Bolton pick means "Trump may have just effectively declared war on Iran," Parsi argued. "As the world awaits Trump’s May 12 decision as to whether he will abandon the Iran nuclear deal, all of the signs now point to a decision to move to war footing." Trump's decision to elevate Bolton to the most important foreign policy position in the White House—which does not require Senate confirmation—comes as the president is planning to meet with North Korean leader Kim Jong-un in the coming weeks after months of back-and-forth threats and rising nuclear tensions. Jon Rainwater, executive director of Peace Action, argued in a statement on Thursday that Bolton's appointment could deal a death blow to the possibility of diplomacy between the U.S. and North Korea. "This isn't just another terrible appointment, this tips Trump's hand about the likelihood of military action on the Korean Peninsula," Rainwater added. "Americans who recognize the recklessness of starting a war with North Korea need to stand up and make themselves heard. Bolton's appointment to this central role at the national security council strongly suggests Trump intends to sabotage the budding diplomatic opening, declare that diplomacy failed, and pivot back to war." Rep. Barbara Lee (D-Calif.)—who had joined anti-war groups in expressing alarm at recent rumors that Bolton could be the next national security adviser—issued a short statement Thursday saying simply, "This is dangerous news for the country and the world." "I hear the drumbeats of war," Lee added.